In July 2004, I was part of Global PR Blog Week 1.0, an online event featuring PR bloggers from around the world, who discussed blogging and communications. Back then, I was fairly new to blogging and found it incredibly fun and valuable to be able to get together with likeminded from other countries and share thoughts and ideas about how new media would influence public relations. I can’t believe it’s been six years since Constantin Basturea brought the group together to create this week of blogging. Anyway, John Cass who was one of the participants, blogged last week about fact that most of the PR bloggers from 2004 were still blogging. I think for most people, blogging serves as a channel for self-expression. It’s a great tool for sharing your thoughts about just about anything, and to be able to actually get some kind of response. For the last five years I have asked Swedish bloggers about why they blog, or more specifically, why they started blogging. The series of surveys is probably the longest running annual blog survey in the world and the latest version called BlogSweden 5 (soon translated to English) revealed that the main reason why people begin to blog remains the same. People blog because they like to write, to express opinions and share what’s on their minds. But also for the social aspects. They network, get feedback and keep in touch with friends and family. 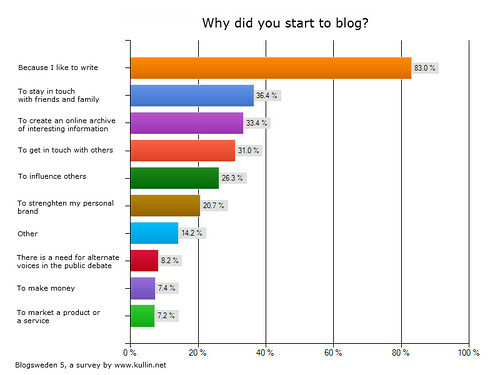 Table: from BlogSweden 5, a survey of 2,251 Swedish blog readers, out of which 94% had a blog. 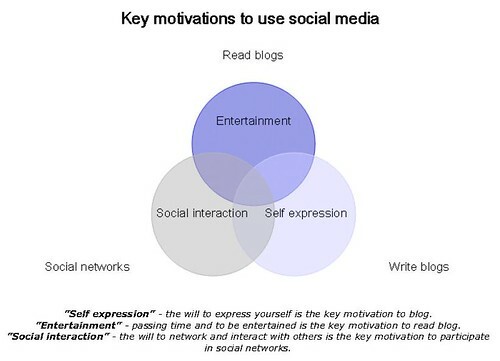 In the report from my BlogSweden 3 survey in 2008, I tried to illustrate the answers from respondents (1,000 Swedish blog readers, of which 806 were bloggers) about what motivates them to use social media. This is not by any means a statistically proven model, but more my view of what drives people to blog, read blogs and participate in social networks. As you see in the image below, many factors motivate users, but some are more related to specific activities. For me personally, blogging has always been a combination of things. First of all, it is a way to push myself to think deeper about a subject and to learn more. When you are forced to articulate your own opinion about a topic, you do more research and it seems to stick better in your memory. Then there is the social aspect. By writing a blog, I engage in a conversation with smart people and that is always a lot of fun. It is also a great way to build a good network. But perhaps most of all, my blogging has always been fuelled by the reactions from other people, who link to or comment about my content. The more (positive) reactions you get, the more fun it is to blog. And that’s where I have a real problem to motivate myself to blog these days. It seems that many people don’t have as much time to blog today as they used to, before Facebook and Twitter grew popular. 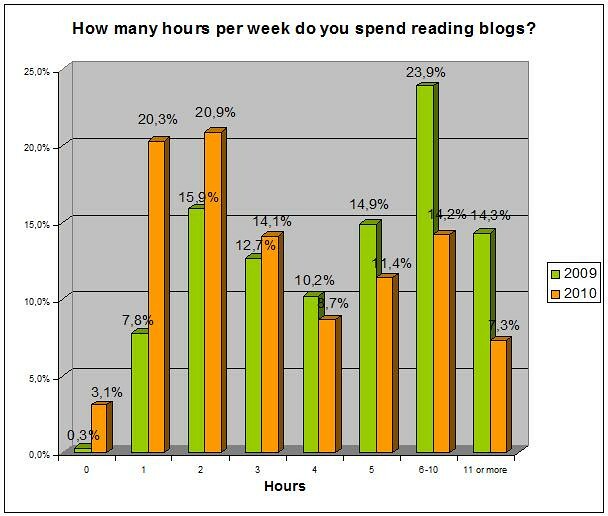 Below is a comparison between how much time Swedish bloggers spent reading blogs in 2009 vs 2010. Data is from my surveys BlogSweden 4 and BlogSweden 5. As you see below, it seems that the time spent reading blogs has decreased. Other data from the surveys suggest that bloggers still update their blogs as often as they used to, but updates are possibly not as time consuming as they used to be. For example, many bloggers now auto-update their blogs with shared links from Google Reader or Delicious, instead of writing their own original content. I have also noticed that previously you could get several bloggers that linked to your content, while today that happens more seldom. Instead, people are keen on retweeting your blog links on Twitter, so traffic to the blog from other sources is still good, but maybe Twitter has increased in importance. If your post doesn’t get traction on Twitter, you don’t get a lot of readers. So I don’t think that we are seeing a return to the glory days of blogging. Instead, maybe we are seeing a divided blogosphere between the bloggers that find value in creating original content and the bloggers that don’t want to spend as much time blogging but instead just share links with a short comment. If you have been blogging for several years, what’s your motivation for still maintaining your blog? I really liked the data you used to support your article. The problem with blogging for me is that there are so many good blogs out there that will never be found because of poor search engine results. Also, there are a lot of poor blogs out there with good search engine resutls. Good content does not ensure a good ranking. This is the true tragedy of the current state of the internet and one of the reasons why I think many bloggers call it quits. Bloggers are writers at heart, not marketers.